Start here to begin working with graphspace-python . You can connect to GraphSpace using your username and password. You can also set the api host using the set_api_host() method if you are using a different server. 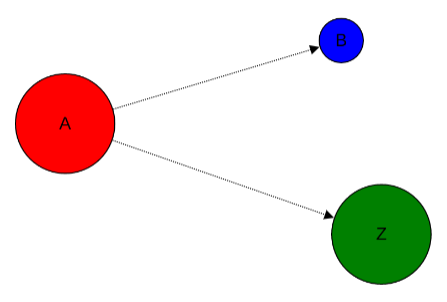 Create an empty graph with no nodes and no edges. You can add one node at a time using the add_node() method. You can also add one edge at a time using the add_edge() method. You can add more meaningful information about the graph like name, description and tags. You can save your graph online using the post_graph() method. You can retrieve your saved graph anytime from GraphSpace using the get_graph() method. You can retrieve a graph by id as well. You can also update your graph anytime using the update_graph() method. You can also make a graph public using the publish_graph() method. You can make a graph public by id as well. You can also make a graph public by passing the graph object itself as param. You can also make a graph private using the unpublish_graph() method. You can make a graph private by id as well. You can also make a graph private by passing the graph object itself as param. You can set a default layout for a graph using the set_default_graph_layout() method. You can set a default layout for a graph by graph id as well. You can set a default layout for a graph by passing graph object itself as param. Similarly you can use layout name instead of id. Or you can only pass layout object provided the object has ‘graph_id’ attribute and layout ‘name’ or ‘id’ attribute as well. You can unset default layout for a graph using the unset_default_graph_layout() method. You can unset default layout for a graph by graph id as well. You can also pass the graph object itself as param. You can also delete your graph anytime using the delete_graph() method. You can delete a graph by id as well. You can also delete a graph by passing the graph object itself as param. Create an empty layout with no node positions and style properties. You can set position of one node at a time using the set_node_position() method. Setting position of an already present node will update its position. You can also add style for a node or an edge by using the add_node_style() and add_edge_style() methods. You can add more meaningful information about the layout like name, sharing status. You can save your layout online using the post_graph_layout() method. You can also save your layout when graph name is known. You can also save your layout by passing graph object as param. You can retrieve your saved layout anytime from GraphSpace using the get_graph_layout() method. You can retrieve a layout by id as well. You can also retrieve a layout by providing graph name instead of id. You can also retrieve a layout by passing the graph object as param. You can also update your layout anytime using the update_graph_layout() method. You can also delete your layout anytime using the delete_graph_layout() method. You can delete a layout by id as well. You can also delete a layout by passing only the layout object as param provided the object has ‘graph_id’ attribute and layout ‘name’ or ‘id’ attribute. You can also use graph name instead of id. Or you can also pass the graph object as param. Create a group providing the name and description. You can also set name and description of the group using the set_name() and set_description() methods. You can save your group online using the post_group() method. You can also view your saved group on GraphSpace. You can retrieve your saved group anytime from GraphSpace using the get_group() method. You can retrieve a group by id as well. You can also update your group anytime using the update_group() method. You can also view your updated group on GraphSpace. You can retrieve the members of your group anytime using the get_group_members() method. You can retrieve group members by group_id as well. You can also retrieve members of a group by passing the group object itself as param. You can add a member to your group anytime using the add_group_member() method. You can add a group member by group_id as well. You can also add a group member to a group by passing the group object as param. You can also view the added member on GraphSpace. You can delete a member from your group anytime using the delete_group_member() method. You can delete a group member by group_id as well. You can also delete a group member by passing the group object as param. Or you can also pass the member object directly. You can retrieve the graphs shared with your group anytime using the get_group_graphs() method. You can retrieve graphs shared with a group by group_id as well. You can also retrieve the shared graphs by passing the group object itself as param. You can share a graph with your group anytime using the share_graph() method. You can share a graph with a group by group_id as well. You can also share a graph with a group by passing the group object as param. You can also provide the graph name instead of id for sharing. Or you can provide the graph object itself as param. You can also view the shared graph on GraphSpace. You can unshare a graph with your group anytime using the unshare_graph() method. You can unshare a graph with a group by group_id as well. You can also unshare a graph with a group by passing the group object as param. You can also provide the graph name instead of id for unsharing. You can also delete your group anytime using the delete_group() method. You can delete a group by id as well. You can also delete a group by passing the group object itself as param. Responses from the API are parsed into the respective object types. Group member response is a list of Member objects. © Copyright 2017, Aditya Bharadwaj Revision 1de2cf6b.